Prčanj is a small town in the Boka Kotorska. The town has a population of 1244 people. It is located ~5 kilometer west of Kotor, opposite Dobrota and between the settlements of Muo and Stoliv. All it’s history has been written at sea. It was one of the most important maritime centers on southern Adriatic. Since the fall of the Roman Empire the small village of Perzagno was populated by Dalmatian Italians and was closely related tho the nearby Cattaro (now called Kotor). While under the rule of the Venetian Republic, Prčanj (then called Perzagno) gained its fame in a rather unique way. By the end of the sixteenth century the administration noticed that sailors from Prčanj journeyed to Venice faster than the government ships. It was then decided that Prčanj be given the responsibility of permanent mail service for the Republic. This was further purported by a decree from 1625 that lauds Perzagno inhabitants for conscientious and effective handling of State mail. The decree was of tremendous significance for the town as it freed its denizens from manual labor – a mandatory form of state service at that time. The decree officially made Prčanj a naval town, and its duties to the State were henceforth of maritime nature only. The importance of reliable mail service was of tremendous value to the Venetian Republic. Prčanj became a port from where the mail from Istanbul that arrived over land through Montenegro continued seaborne towards Venice. Perzagno ships were initially small in size and held a crew of nine. The ships were ready to sail year around and would negotiate the 400 mile journey to Venice by oar and sail. The town’s privileges grew and, in 1704, Perzagno was granted its own municipal district inside the Albania Veneta. When the Boka Kotorska was part of the Austrian empire, Emperor Franz Josef came here and was greeted by several dozens of uniformed ship captains. 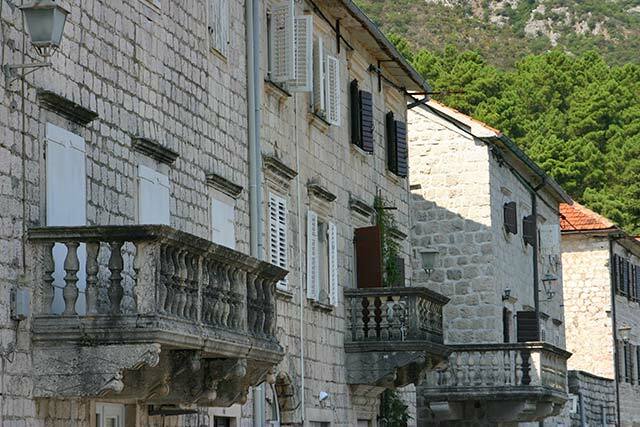 Architecture in Prčanj bears witness to its prosperity in the 17th and 18th centuries. The town’s waterfront consists of a long line of stone villas, unified by their beautiful facades and separated by gardens and olive orchards. The most impressive feat of architecture in Prčanj is the Nativity of the Blessed Virgin Mary church Bogorodicin Hram. It seems out of proportion to the number of inhabitants and took 120 years to build (1789–1909). It was designed by a Venetian architect Bernardino Maccaruzzi. 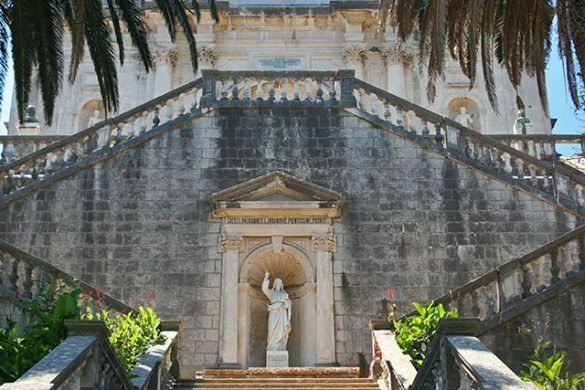 The church has a monumental baroque facade with Corinthian and Doric columns and displays a collection of paintings and sculptures worthy of its size, including works by Piazzetta, Tiepolo, Balestra, Meštrović, and numerous other artists. 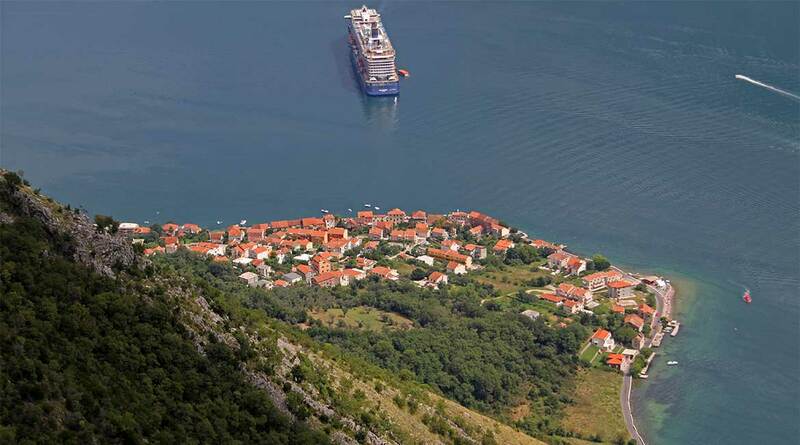 Due to the limited space in Kotor itself, in recent years much has gone to the surrounding villages of Muo, Prčanj to meet the growing accommodation demand. The location of Kotor with the narrow coastal strip with little space is the cause of this. At first glance this part seems to belong entirely to Kotor, because the transition between Kotor and the surrounding villages is not easy to see or not. Most new accommodations have been built in Muo and Prčanj. Situated next to each other at the foot of the Vrmac mountain, which cuts the bay in half, it faces Kotor, which gives a nice panoramic view of the old town of Kotor, and the back Orjen and Lovćen mountains. However, both villages also have their own history and beauty, which made them a suitable place for tourism development. Muo itself is closer to Kotor, and Prcanj a bit further, so it is not really within walking distance. Prcanj hereby has something bigger and has a larger history of its own. As a result, accommodation can also be found in the renovated and transformed sailor’s villas, just as in Kotor. Hotel Splendido – Hotel Splendido features an outdoor swimming pool with a large terrace with sun loungers. It offers free Wi-Fi in public areas. All rooms have free wired internet, air conditioning, cable TV, minibar, bathrobe and slippers. The Tramontana restaurant serves Italian cuisine both indoors and on the terrace. The restaurant specializes in fish dishes and traditional Montenegrin dishes. The bar offers a drinks menu with cocktails and more. You can also enjoy a massage at Splendido. Facilities : Free Wi-Fi Internet, Free Parking, Outdoor Swimming Pool (seasonal), Massage (surcharge), Bar, Pets Allowed, Terrace, Garden, Outdoor furniture, Restaurant (à la carte), Breakfast in the Room, Accessible Parking, Private Check-in / -out, Luggage Storage 24-Hour Front Desk, Babysitting / Child Services (surcharge), Ironing Service (surcharge), Laundry (surcharge), Dry Cleaning (surcharge), Meeting / Banquet Facilities, Car Hire, Airport Shuttle. Villa Banicevic – Offering free WiFi in all areas, Palazzo Banicevic Luxury Rooms is located in Prcanj. This 5-star guest house offers air-conditioned rooms with a private bathroom. The rooms have a terrace with sea views. At this guest house you can rent bikes and offer excellent service. It is located next to the historical monument of the Tre Sorelle villa. Facilities : Free parking, Free Wi-Fi, Terrace, Sun Terrace, Garden, Airport Shuttle, Patio, Outdoor Swimming Pool (seasonal), BBQ Facilities, Extra Long Beds (> 2 meters), Fitness Center, Sauna, Massage (surcharge), Spa & Wellness Center, Hot Tub / Jacuzzi, Bike rental. Apartmani Saxo – This property is a 1-minute walk from the beach. Apartments Saxo is just 10 meters from the sea. It offers air-conditioned apartments with free Wi-Fi. All apartments include a TV and DVD player, as well as a fully equipped kitchen with a dishwasher. The private bathrooms are equipped with a shower and towels. Some units have a balcony and a washing machine. The nearest supermarket is right next to the property and a restaurant is 100 meters away. There is a private beach with sun loungers and parasols. The property offers free parking and reduced car rental rates. Facilities : Free Wi-Fi, Picnic Area, Garden, BBQ Facilities, Free Parking, Private Beach Area, Sun umbrellas, Sun Loungers, Daily Maid Service (surcharge), Airport Shuttle, Car Rental. 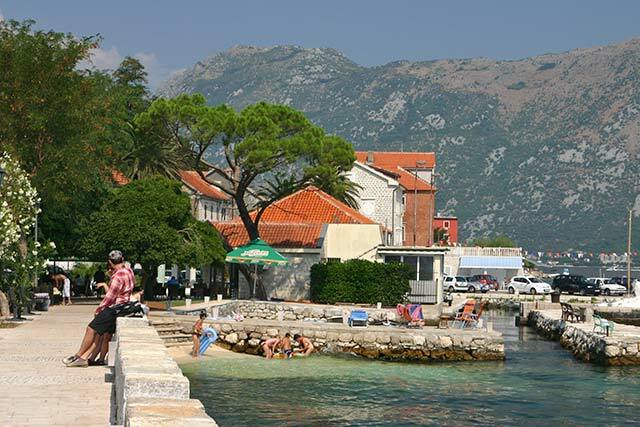 Budva — the Montenegrin touristic metropolis on the Adriatic Sea is located some 20km south of the Boka Kotorska. Cetinje — the historical capital of Montenegro is located just under Mt Lovćen, the mountain overlooking the Boka Kotorska. Dubrovnik — the hub of Croatian tourism can be reached from Herceg Novi in less than 40 minutes north of the Boka Kotorska. 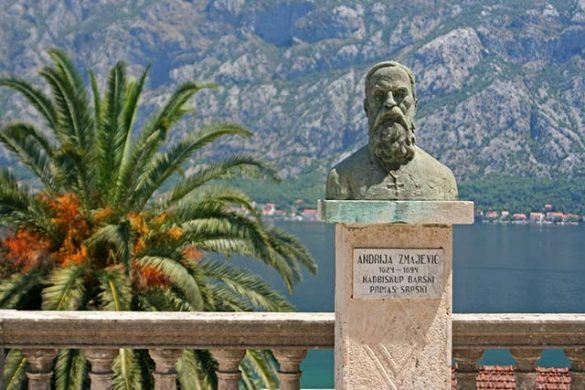 Lovćen national park — Mount Lovćen rises from the borders of the Adriatic basin closing the long ang twisting bays of Boka Kotorska and making the hinterland to the coastal town of Kotor. The mountain has two imposing peaks, Štirovnik (1,749 meter) and Jezerski vrh (1,657 meter). The mountain slopes are rocky, with numerous fissures, pits and deep depressions giving its scenery a specific look. Standing on the border between two completely different natural wholes, the sea and the mainland, Lovćen is under the influence of both climates. Risan — visit the site of Roman ruins and some fairly well-preserved mosaic floors that had been in a Roman house during 2nd century A.D.
Herceg Novi — take a walk on the 6 km-long 5 Danica’s esplanade to meet with the rich and diverse history of the town. Perast — a well preserved village, built entirely in barroque style, a UNESCO World Natural and Historical Heritage Site. From Perast there is a boat ride to the man-made islet of Gospa od Škrpjela. Upon returning home safely, seamen dropped rocks and old boats filled with rocks in this place and gradually created the islet as the foundation for the church. Njegos Mausoleum — The mausoleum of Petar Petrovic Njegos built of limestone and granite can be found on top of Mount Lovćen. It was Njegos’s last wish, the greatest ruler of the Montenegrins who was a bishop and a poet at the same time to be buried there. Tivat — a small town, quickly emerging into a major touristic, business and transport center. Located in the vicinity of the Tivat International Airport, in summer 2014 it became home of a luxury yacht marina called Porto Montenegro. Mamula — Guarding the entrance to the bay, is this prison island built by Austro-Hungarian general Lazar Mamula in mid 19th century. During the World War II, the fort was used as a prison by the Italians. The island of Gospa od Skrpjela — (Our Lady of the Rock). The Island Gospa od Skrpjela is one of two gorgeous islands in Kotor Bay, which are situated in the bay across from Perast (in the Kotor municipality). The other island, which also should be visited, is the Island Sveti Djordje (St. George). Plava Spilja — A blue grotto in the bay. It is 5.7 nautical miles away from Herceg Novi. During the summer season, you can take private boats from Herceg Novi to Plava Spilja. Mount Orjen — Mount Orjen at 1,894 meters is the highest mountain on the Adriatic coastline and dominates the entrance to the Boka Kotorska and it’s surrounding.